RajanBabu received his B. Sc (Special) and M. Sc. degrees from Kerala University and The Indian Institute of Technology (IIT, Madras) respectively. He obtained a Ph. D. degree from The Ohio State University working with Professor Harold Shechter, and was a postdoctoral fellow at Harvard University with the late Professor R. B. Woodward. 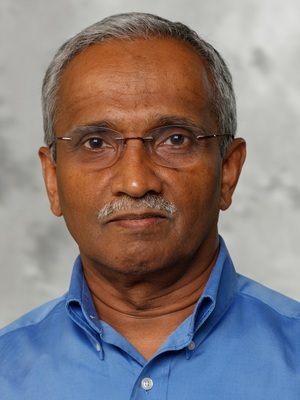 He then joined the Research Staff of Dupont Central Research and Development becoming a Research Fellow in 1993. He returned to Ohio State as a Professor of Chemistry in 1995 and is currently a Distinguished Professor in the College of Arts and Sciences. We are engaged in two major areas of research that deals with new methodology for stereoselective synthesis: (a) enantioselective catalysis of C-C, C-H and C-N bond formations; (b) novel multi-component cyclization methods that lead to uncommon, atropisomeric 1,3-diene derivatives. These intermediates are formed with vinyl Si, Sn or B moieties, which make them useful for further stereoselective transformations. We are also pursuing applications of the newly developed methods for the synthesis of biologically relevant molecules. In the asymmetric catalysis area, we recently developed practical methods for C-C bond-formations based on hydrovinylation of vinylarenes, 1,3-dienes and strained olefins. Applications of this chemistry include a new highly enantioselective synthesis of popular 2-arylpropionic acids such as (S)-ibuprofen, and a new approach to controlling the exocyclic side-chain stereochemistry in molecules such as pseudopterosins, deoxyeseroline (a molecule containing an all-carbon quaternary asymmetric center) and side-chains of steroid D-ring substituents. Examples of multi-component addition/cyclization of diynes (giving novel axially chiral 1,3-dienes), and a prototypical highly functionalized dibenzocyclooctadiene that has been synthesized by this chemistry are shown below. In other published work we have shown that related cyclization of allene-aldehydes allows expeditious entry into highly alkylated indolizidine alkaloids such as IND-223A. Other areas of our research interests are, coordination catalysis (asymmetric ring opening reactions of epoxides and aziridines), asymmetric hydrocyanation, new free radical cyclization methods, development of organometallic reagents for aqueous organic chemistry, and synthesis of feedstock chemicals from renewable sources. External support for our research comes primarily from by the National Science Foundation and the National Institutes of Health. Former members of our group hold faculty positions at Nagoya University (Japan), University of North Carolina (Chapel Hill), Hanyang University (Korea), Indian Institute of Technology (Rajasthan); National Changhua University of Education (Taiwan); research positions at National Institute of Health, Federal Drug Administration as well as industrial positions at Abbott Pharmaceuticals, Albany Molecular, Boehringer-Ingelheim, Firestone, Manville, Novartis, Pharmacore and Sanofi Aventis. I recruit 1-3 graduate students each academic year and welcome inquiries regarding these openings. "Broadly Applicable Stereoselective Syntheses of Serrulatane, Amphilectane Diterpenes, and Their Diastereoisomeric Congeners Using Asymmetric Hydrovinylation for Absolute Stereochemical Control", Tenneti, S.; Biswas, S.; Cox, G. A.; Mans, D. J.; Lim, H. J.; RajanBabu, T. V. J. Am. Chem. Soc. 2018, 140, 9868-9881. "Tandem catalysis for asymmetric coupling of ethylene and enynes to functionalized cyclobutanes", Pagar, V. V.; RajanBabu, T. V. Science 2018, 361, 68-72. "Catalytic Enantioselective Hetero-dimerization of Acrylates and 1,3-Dienes", Jing, S. M.; Balasanthiran, V.; Pagar, V.; Gallucci, J. C.; RajanBabu, T. V. J. Am. Chem. Soc. 2017, 139, 18034-18043. "Control of Selectivity through Synergy between Catalysts, Silanes, and Reaction Conditions in Cobalt-Catalyzed Hydrosilylation of Dienes and Terminal Alkenes", Raya, B.; Jing, S.; Balasanthiran, V.; RajanBabu, T. V. ACS Catalysis 2017, 7, 2275-2283. "Russian Nesting Doll Complexes of Molecular Baskets and Zinc Containing TPA Ligands", Zhiquan, L.; Polen, S.; Hadad, C. M.; RajanBabu, T. V.; Badjić, J. D. J. Am. Chem. Soc. 2016, 138, 8253-8258. "Selective Cobalt-Catalyzed Reduction of Terminal Alkenes and Alkynes Using (EtO)2Si(Me)H as a Stoichiometric Reductant", Raya, B.; Biswas, S.; RajanBabu, T. V. ACS Catalysis 2016, 6, 6318-6323. "Cobalt-Catalyzed Asymmetric Hydrovinylation of 1,3-Dienes", Timsina, Y. N.; Sharma, R. K.; RajanBabu, T. V. Chem. Sci. 2015, 6, 3994-4008. "Asymmetric Catalysis with Ethylene. Synthesis of Functionalized Chiral Enolates", Biswas, S.; Page, J. P.; Dewese, K. R.; RajanBabu, T. V. J. Am. Chem. Soc. 2015, 137, 14268-14271. "Coupling of Propylene Oxide and Lactide at a Porphyrin Chromium(III) Center", Balasanthiran, V.; Chatterjee, C.; Chisholm, M. H.; Harrold, N. D.; RajanBabu, T. V.; Warren, G. A. J. Am. Chem. Soc. 2015, 137, 1786-1789. "Bimetatlic catalysis in the highly enantioselective ring-opening reactions of aziridines", Wu, B.; Gallucci, J. C.; Parquette, J. R.; RajanBabu, T. V. , Chem. Sci. 2014, 5, 1102-1117. “Hydrovinylation Reactions in Organic Synthesis”, RajanBabu, T. V.; Cox, G. A.; Lim, H. J.; Nomura, N.; Sharma, R. K.; Smith, C. R.; Zhang, A. In Comprehensive Organic Synthesis, 2nd Edition; Molander, G. A., Knochel, P., Eds. ; Elsevier: Oxford, 2014; Vol. 5, pp 1582-1620. “Hydrocyanation in Organic Synthesis”, RajanBabu, T. V. In Comprehensive Organic Synthesis, 2nd Edition; Molander, G. A., Knochel, P., Eds. ; Elsevier: Oxford, 2014; Vol. 5, pp 1772-1793. "Triarylphosphine Ligands with Hemilabile Alkoxy Groups: Ligands for Nickel(II)-Catalyzed Olefin Dimerization Reactions. Hydrovinylation of Vinylarenes, 1,3-Dienes, and Cycloisomerization of 1,6-Dienes", Biswas, S.; Zhang, A.; Raya, B.; RajanBabu, T. V. Adv. Synth. Catal. 2014, 356, 2281-2292. "Conformation and reactivity in dibenzocyclooctadienes (DBCOD). A general approach to the total synthesis of fully substituted DBCOD lignans via borostannylative cyclization of alpha,omega-diynes", Gong, W.; RajanBabu, T. V. Chem. Sci. 2013, 4, 3979-3985. “Asymmetric Hydrovinylation of 1-Vinylcycloalkenes. Reagent Control of Regio- and Stereoselectivity”, Page, J. P.; RajanBabu, T. V. .J. Am. Chem. Soc. 2012, 134, 6556-6559. “Asymmetric Hydrovinylation of Vinylindoles. A Facile Route to Cyclopenta[g]indole Natural Products (+)-cis-Trikentrin A and (+)-cis-Trikentrin B” Liu, W.; Lim, H. J.; RajanBabu, T. V. J. Am. Chem. Soc. 2012, 134, 5496-5499. “On the Stereochemistry of Acetylide Additions to Highly Functionalized Biphenylcarbaldehydes and Multi-component Cyclization of 1,n-Diynes. Syntheses of Dibenzocyclooctadiene Lignans”, Gong, W.; Singidi, R. R.; Gallucci, J. C.; RajanBabu, T. V. Chem. Sci. 2012, 3, 1221–1230. “Phosphinite and Phosphonite Ligands”, in Phosphorus (III) Ligands in Homogeneous Catalysis- Design and Synthesis, Paul C. J. Kamer, Piet W. N. M. van Leeuwen, Eds. Wiley: London, 2012, pp. 159–232. “Enantioselective Hydrovinylation of Alkenes”, RajanBabu, T. V. in Comprehensive Chirality, Yamamoto, H.; Carreira E., Eds. Elsevier: London, 2011. "Ethylene in Organic Synthesis. Repetitive Hydrovinylation of Alkenes for Highly Enantioselective Syntheses of Pseudopterosins", Mans, D. J.; Cox, G. A.; RajanBabu, T. V. J. Am. Chem. Soc. 2011, 133, 5776–5779. “Stereoselective Cyclization of Functionalized 1,n-Diynes Mediated by [X-Y]- Reagents [X-Y = R₃Si-SnR’₃ or (R₂N)₂B-SnR’₃]. Synthesis and Properties of Atropisomeric 1,3-Dienes”, Singidi, R. R.; Kutney, A. M.; RajanBabu, T. V. J. Am. Chem. Soc.2010, 132, 13078-13087. "Asymmetric Hydrovinylation of Unactivated Linear 1,3-Dienes", Sharma, R. K;. RajanBabu, T. V. J. Am. Chem. Soc. 2010, 132, 3295-3297. "Regiodivergent Ring Opening of Chiral Aziridines", Wu, B.; Parquette, J. R.; RajanBabu, T. V. Science 2009, 326, 1662. "Enantioselective Desymmetrization of meso-Aziridines by TMSN₃ and TMSCN Catalyzed by Discrete Yttrium Complexes"", Wu, B.; Parquette, J. R.; RajanBabu, T. V. Angew. Chem. Int. Ed. Engl. 2009, 48, 1126-1129. "Conformationally Driven Asymmetric Induction in a Catalytic Dendrimer", Yu, J.; RajanBabu, T. V.; Parquette, J. R. J. Am. Chem. Soc. 2008, 130, 7845-7847. "Ligand Tuning in Asymmetric Hydrovinylation of 1,3-Dienes. A Stereoselective Route to either Steroid-C20(S) or -C20(R) Derivatives", Saha, B.; Smith, C. R.; RajanBabu, T. V. J. Am. Chem. Soc. 2008, 130, 9000-9005. "All Carbon Quaternary Centers via Asymmetric Hydrovinylation. New Approaches to the Exocyclic Side Chain Stereochemistry Problem", Zhang, A.; RajanBabu, T. V. J. Am. Chem. Soc. 2006, 128, 5620-5621. "Hydrovinylation of 1,3-Dienes. A New Protocol, an Asymmetric Variation, and a Potential Solution to the Exocyclic Side Chain Stereochemistry Problem", Zhang, A.; RajanBabu, T. V. J. Am. Chem. Soc. 2006, 128, 54-55. A Review of recent research:“Hydrovinylation Reactions in Organic Synthesis”, Comprehensive Organic Synthesis, 2nd edition, Vol. 5, Oxford: Elsevier; 2014. pp. 1582-1620. DOI: 10.1016/B978-0-08-097742-3.00533-4.